I came across this walking downtown. You can’t really see it in my picture here, but there’s a picture of Eric holding a bike over his head with this joyful expression on his face. Every day there seems to be a story of a hit and run. I don’t know if Eric’s killing was also a hit and run, but the hit and run aspect just takes these things into a whole other category of evil, doesn’t it? Someone can’t even be bothered to stop and help the person they just hit?? What if stopping could have saved them? There is a tolerance for lawlessness from drivers in the city that is criminal. I know how insane and assholish pedestrians can be. I’ve been in cars in the city and I see how they just walk in front of cars, and then not only do they cross when they don’t have the light they take their freaking time about it, and so many bike riders act like the rules don’t apply to them period, but bottomline, the corresponding assholishness from drivers kills people. I walk all the time everywhere, and therefore have almost been hit by cars more than most. I’m not surprised by the number of hit and runs at all. I would be happy with a general crackdown on all sides, but I wish something would be done about it already. It doesn’t have to be like this. I’ve been in other cities where everyone follows the traffic rules. “assholishness” ??? what a cool new word !! Sad to say, the only solution is to price driving an automobile in Manhattan out of the hands of most folks. 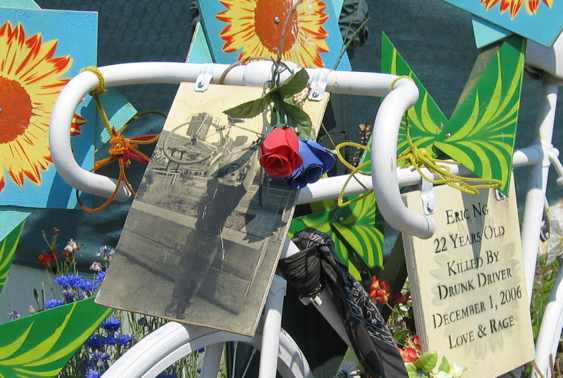 those “ghost bike” memorials are incredible. the worst part about this particular one is that the guy killed was riding on a bike path! I wish I could take credit for assholishness!